CERN Confirms Discovery of Higgs Boson - Meyer Tool & Mfg. We’re not sure what the bigger news was this month, that CERN researchers confirmed last summer’s initial finding that the Large Hadron Collider discovered the Higgs boson (or at least a type of Higgs boson) or the play it received in the media. In this time of expected shrinkage in US government support of the basic sciences, including high energy physics, it is encouraging that the media not only heavily reported this story but included background on the long term benefits this type research pays back to society within their reports. The fact that this discovery is of interest to the general population and not just those with a personal interest in the subject is evidenced by the emails we were sent with links by friends and family aware of our interest. Here is a cross section of some of the links. We at Meyer Tool are proud that our equipment played a part in this discovery. Congratulations to everyone involved in this momentous discovery. 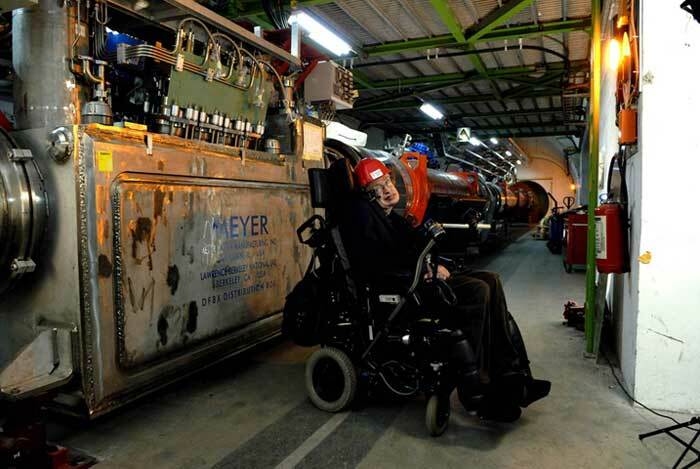 World-renowned physicist Stephen Hawking at CERN, in front of one of eight distribution boxes manufactured by Meyer Tool & Manufacturing for the Large Hadron Collider. Photo ©CERN.